For the best Maytag brand has to offer, this high capacity dryer is packed with features that make light work of heavy loads. This model boasts a stout 8.8 cu. ft. capacity that's made to dry 21 towels in a single load, and the PowerDry cycle that gets your toughest loads completely dried faster1. * Plus, this large capacity dryer with steam-enhanced cycles and options has brains to match its brawn. Moisture sensors mean you can count on it to get clothes the right amount of dry, while the extra interior fin creates a random tumbling pattern and keeps clothes moving for exceptional drying performance. And to top it off, this dryer is designed, engineered and assembled in the U.S.A. with a 10-year limited parts warranty2. 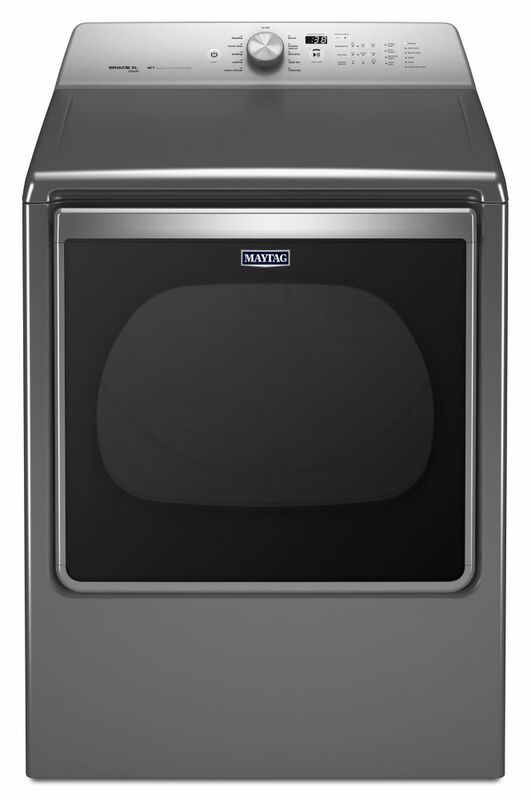 Maytag Top Load Washer with the Deep Fill Option and PowerWash Cycle - 6.0 cu. ft.
LG TurboSteam technology to the rescue. Toss the shirt in the dryer, turn on TurboSteam and in just 10 minutes your shirt is back in tip-top shape. Also helps refresh fabrics and reduce wrinkles in half the time of other steam settings. Offering the Best Cleaning in its class driven by the PowerWash. cycle,1 this largest capacity agitator top load washer boasts a 5.4 cu. ft. capacity and tackles both stubborn stains and crusted-on messes. For more water when you want it, the Deep Fill option offers a maximum fill to help rinse away soils, while the PowerWash. agitator provides concentrated cleaning and robust wash action to remove tough stains. Plus, the Rapid Wash cycle on this high efficiency washer helps clean loads faster by shortening cycle time. Add a 10-year limited parts warranty32 on the direct drive motor and wash basket, and you've got the power to clean tough loads for the long haul. 8.8 cu. ft. Front Load Electric Dryer in Chrome Shadow - ENERGY STAR® For the best Maytag brand has to offer, this high capacity dryer is packed with features that make light work of heavy loads. This model boasts a stout 8.8 cu. ft. capacity that's made to dry 21 towels in a single load, and the PowerDry cycle that gets your toughest loads completely dried faster1. * Plus, this large capacity dryer with steam-enhanced cycles and options has brains to match its brawn. Moisture sensors mean you can count on it to get clothes the right amount of dry, while the extra interior fin creates a random tumbling pattern and keeps clothes moving for exceptional drying performance. And to top it off, this dryer is designed, engineered and assembled in the U.S.A. with a 10-year limited parts warranty2. 8.8 cu. ft. Front Load Electric Dryer in Chrome Shadow - ENERGY STAR® is rated 1.0 out of 5 by 1. Rated 1 out of 5 by nehebkau from Didnt work right out of the box I purchased this from home depot for my new home. It sat in its box in our heated garage waiting to be installed. The installer unboxed it, plugged it in and it didnt work. After bringing in the electrician to check the wiring as home depot suggested we narrowed it down to the dryer being broken on delivery. we asked HD for an exchange and were told to contact Maytag who told us to contact the purchaser since it was delivered defective. Now I am stuck with kids and a dryer that I paid a lot of money for and that does not work.... well HD I was about to get your credit card to do a kitchen and bathroom reno but I guess I will go to another retailer who actually cares about their customers.